Tesla self-driving cars: CEO Elon Musk prefers camera-based "autopilot" system. 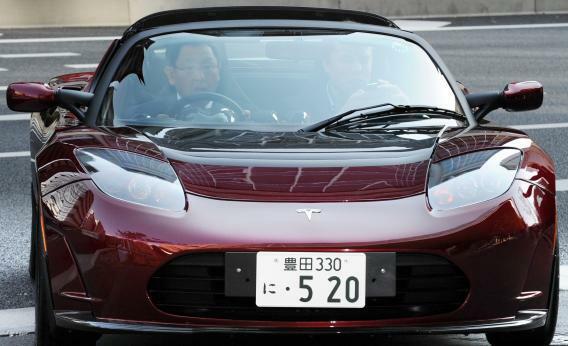 Toyota Motors President Akio Toyoda (L) and Tesla Motors CEO Elon Musk drive a Tesla Roadster in 2010. Both companies have separate plans for computerized driving-assistance technology. Google has been talking a lot lately about moon shots—risky technologies with the potential to revolutionize industries, rather than simply staying a step ahead of rivals. But when it comes to one of Google’s most exciting projects, the self-driving car, the company may soon have some competition from someone who knows a thing or two about outer space. Tesla’s Elon Musk, who also runs the space exploration company SpaceX, told Bloomberg News in an interview published today that the electric-car company may develop its own driverless technology. “Self-driving cars are the natural extension of active safety and obviously something we should do,” Musk said. He added that while Tesla has “had some technical discussions with Google” about its Lidar tracking system, he finds that ultra-high-tech approach too expensive. Tesla is more likely to develop its own, less costly, camera-based system instead. One other interesting point: Musk thinks we should be talking about “autopilot” rather than “autonomous,” “self-driving,” or “driverless” cars: “Self-driving sounds like it’s going to do something you don’t want it to do. Autopilot is a good thing to have in planes, and we should have it in cars.” As Bloomberg’s Alan Ohnsman points out, that’s more in line with the approach of other car companies like Toyota, which is working on a “virtual co-pilot” system by which sensors help drivers avoid crashes. I guess Musk prefers to reserve the term “autonomous” for his actual moon shots.